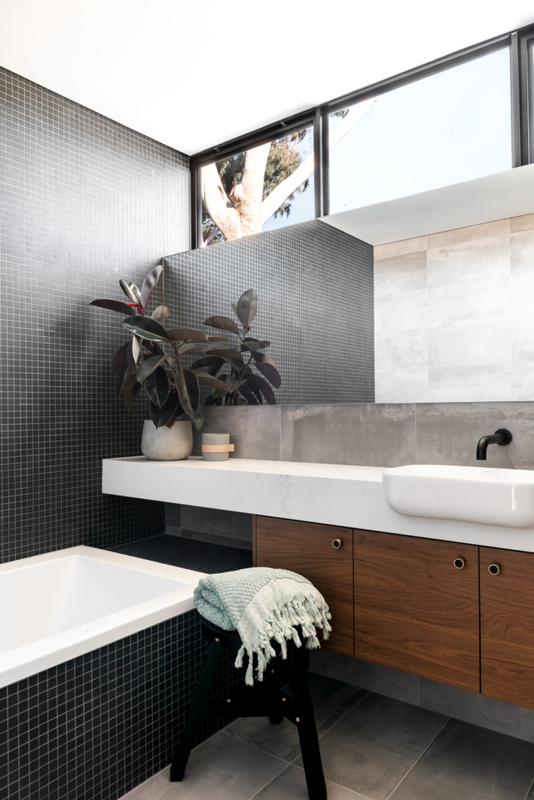 Appropriately titled ‘The Ash,’ this newly built Perth home uses materials such as concrete, timber and brick in a moody palette of black, charcoal and greige to create a dramatic and sophisticated family abode. 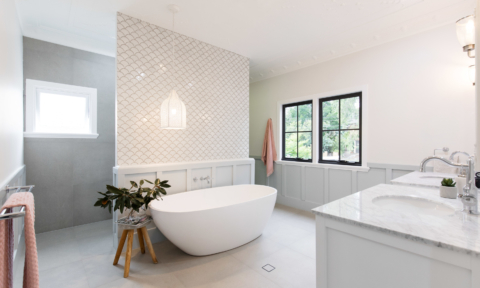 The stylish space houses builder Sam Ruocco, of Limitless Building, his wife Sarah and their four year old daughter and is located in the Perth suburb of Morley. 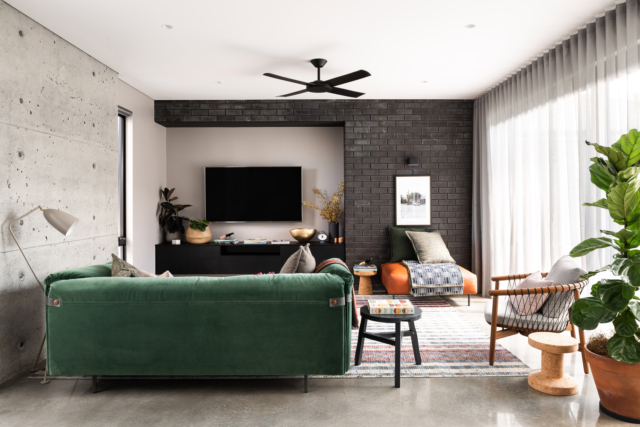 Rather fittingly for a builder, when the home was in its early design stages, Sam and his family showed a keen interest in gritty, urban materials and details. “It was critical that raw materials such as brickwork, concrete, steel and timber were present in the design. 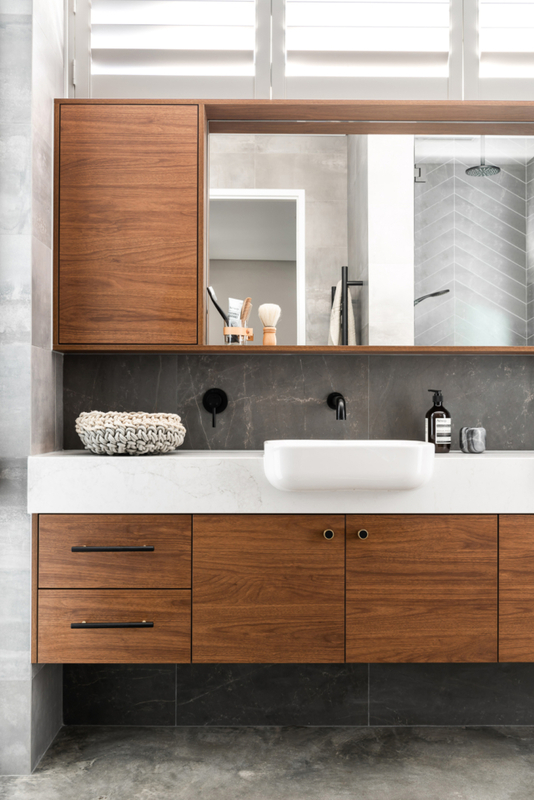 We pulled these external materials throughout the design internally to create cohesion between the internal and external,” says the home’s designer Janik Dalecki of Dalecki Design. 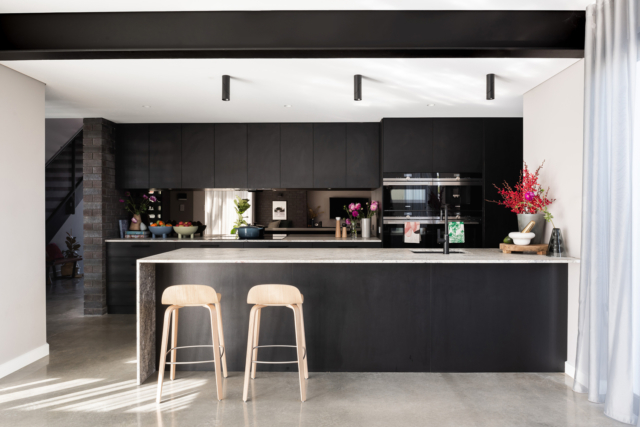 “At the core of the brief was to create a light, bright home with a functional layout utilising a mixed material palette. 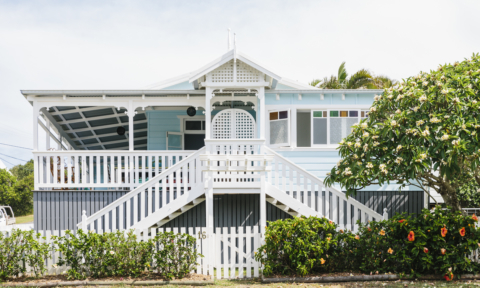 The owners also placed high importance on the synergy and connection between the indoor and outdoor living zones that take advantage of the northern outlook,” says Janik. 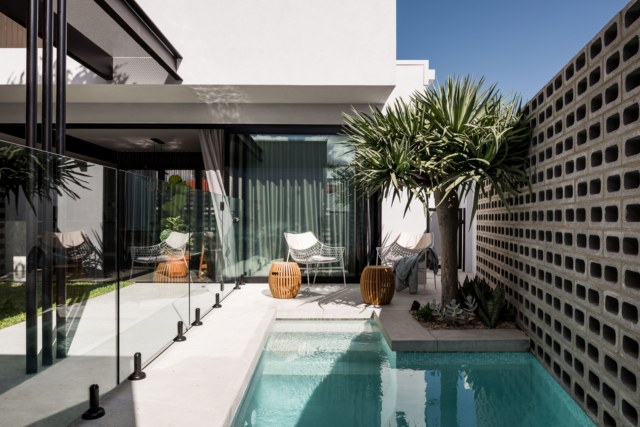 The outdoors are certainly never far from view – even the pool can be viewed from the entrance due to the home’s design. 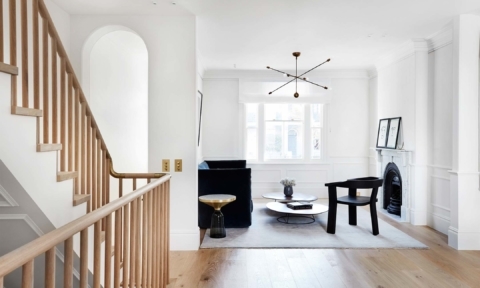 “One of my top picks would have to be the entrance passage. 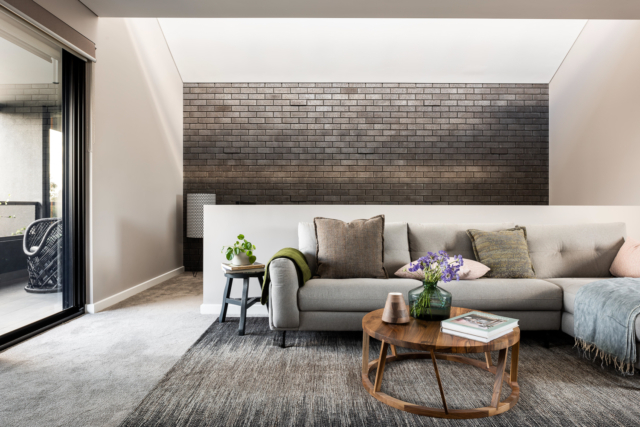 The two and a half high voids with subtle patterned brickwork is pretty eye catching upon entering. 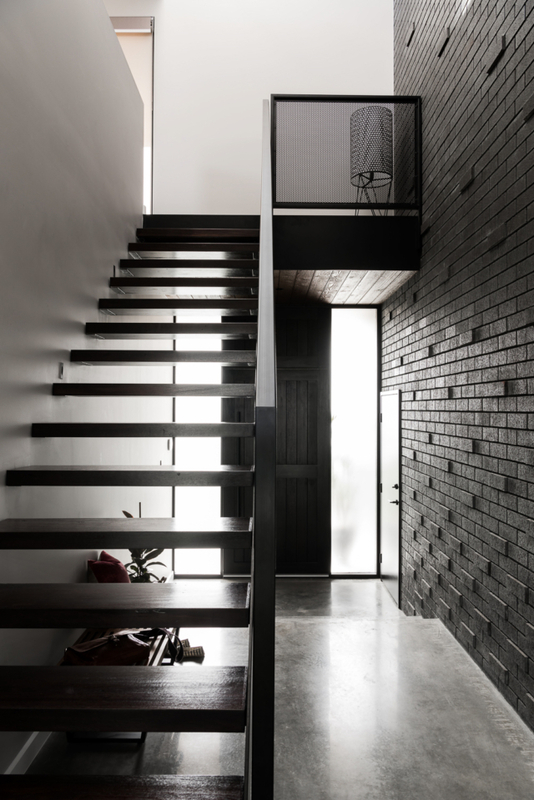 This combined with the hit and miss block wall in front of the glass window at the end of the entry passage creates a very interesting and dramatic entry space,” says Janik. 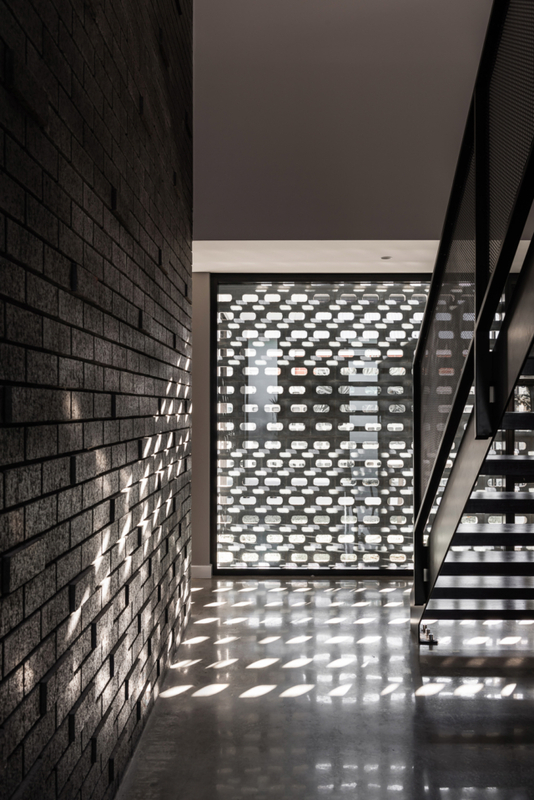 “The overall height of the void really takes you by surprise and then the block work, with glimpses out to the backyard and pool, catches your interest and draws you,” says Janik who explains that the afternoon sun throws interesting patterns all over the entry floor too. 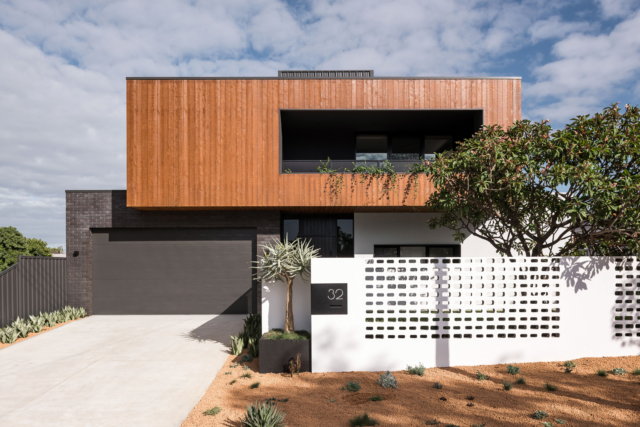 Particular attention was paid to the design of the home’s stylish outdoor space and though relatively small, it’s been meticulously planned. 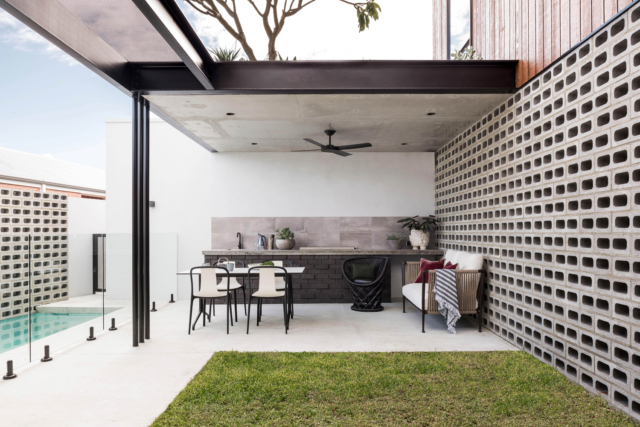 “I love how the internal space connects directly with the external space, but rather than the internal opening out to an alfresco space as a house traditionally would, it opens to a landscaped area with the alfresco beyond. The alfresco is still in sight and close, but with the landscaped lawn area between the two, the feeling when inside of being connected to the exterior is so much greater as you can literally step onto the lawn from the dining room,” says Janik. 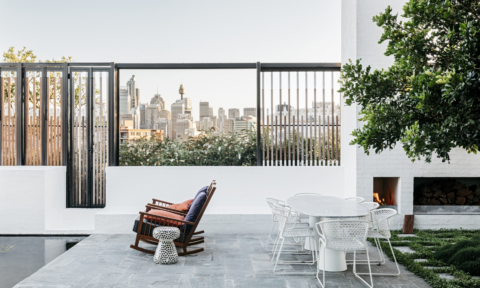 The u-shaped alfresco courtyard features a roof garden atop – a feature enjoyed from the first floor of the home. 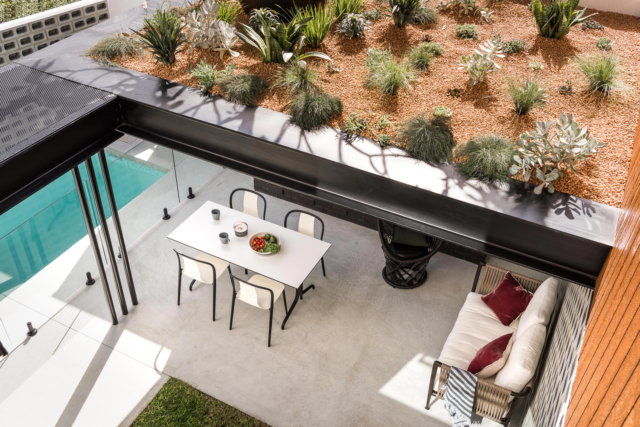 “The roof garden really adds to this space and considering we were left with minimal free ground floor land for landscaping I feel was critical. 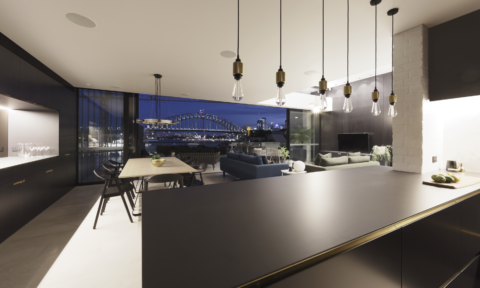 Not only does it provide some great vistas from the ground floor, but it really shines when on the upper floor,” says Janik. 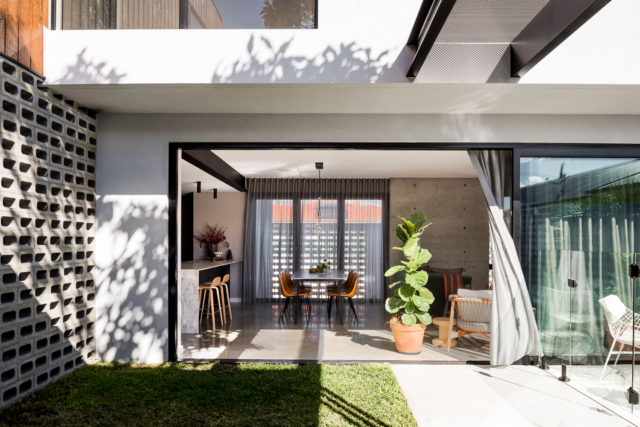 “Additionally, the inclusion of the central courtyard and u-shape design has meant the entire interior is flooded with natural light including the central passage which is often one of the darker areas of a house,” says Janik. 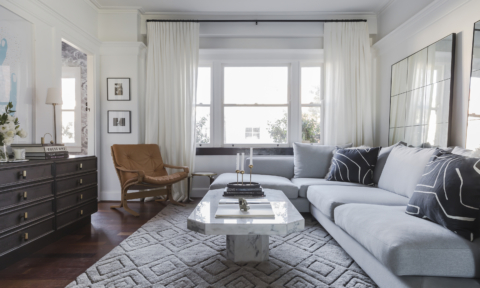 “Overall with the design I feel the further you delve into the house the more it gives you. 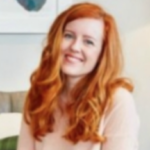 It does not reveal all of its cards upon entering the front door, but gives you cheeky little hints of what is around the corner constantly,” says Janik. And at nightfall, the home reveals an entirely new mood again. 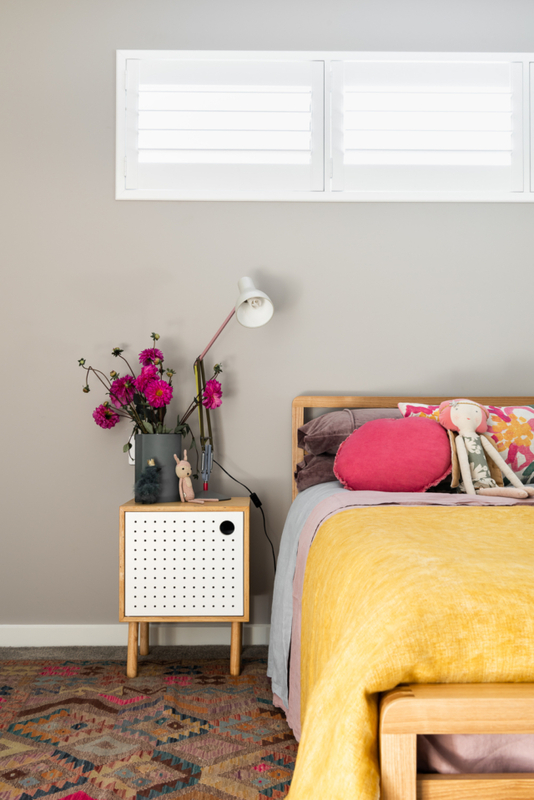 “During the day the house is very light and bright despite having a very moody and textured palette. 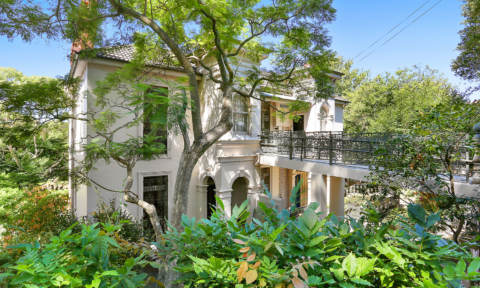 The house has a great energy and connection to the exterior making it a fabulous open space to live and entertain in. 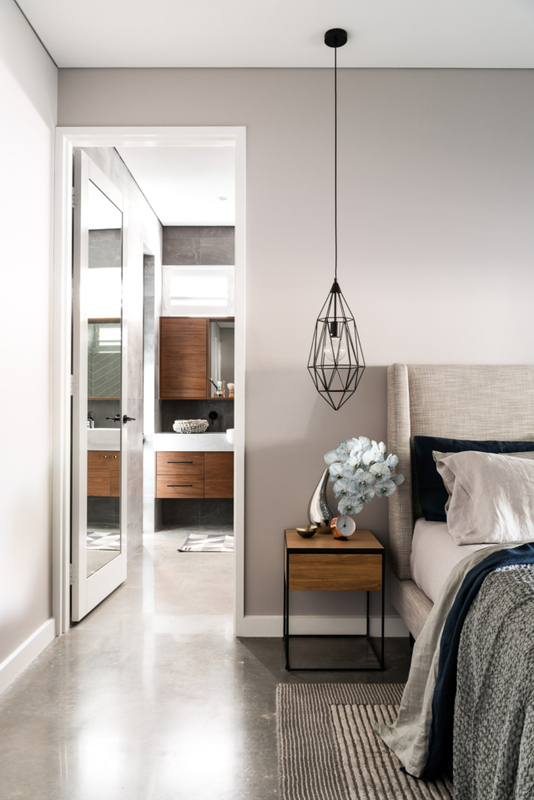 However, in the evening when the curtains are closed and the light much dimmer, the space completely changes to a much darker, moodier and cosier space really letting the darker and textured materials come to life,” says Janik. 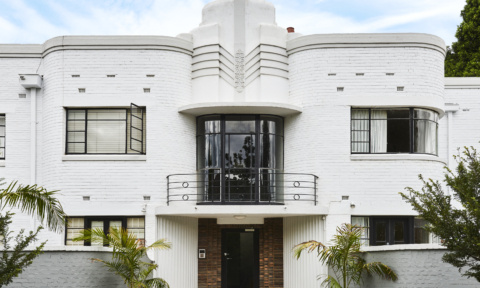 Perth readers can tour this home (and many fabulous others) when it opens as part of the upcoming Open House Perth programme on November 10-11, 2018.